Seeing the pictures on social media was heartbreaking. Happy Tuesday to all of my Fall Brawl competitors. Fish are biting out there in Mother Erie with catches coming in from boat and shore. I’ve seen lots of pictures from Lorain, Cleveland and Huron of some nice walleye. No giants yet, but as we all know, that can change in an instant. I still haven’t been out, but am hoping to change that this weekend! I have a whole bunch of lures I need to wash, and I need to get to Erie Outfitters to get a new Fall Brawl hat. I hope they have one that’ll fit my bucket-head. Anyway, this entry is going to be less about the brawl and more about loss. Something happened two weekends ago that sent shockwaves through the Lake Erie fishing community. 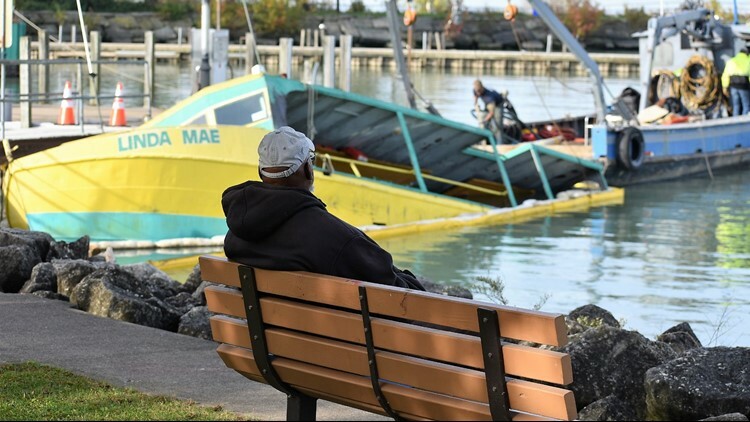 During heavy weather, the Linda Mae, longtime Lake Erie head boat, broke free from her dockage and was pushed onto the rocks at Wildwood Marina. Her back half was swamped and filled with water and down she went. According to the nearby instruments at the water plant, they recorded a 4 to 5 foot storm surge that got into the harbor, lifting the floating docks and unfortunately, snapped the mooring ropes from the old girl. Seeing the pictures on social media was heartbreaking. Many years ago, I used to take trips on the Linda Mae. I never fished Erie much, and the club I used to belong to, The Summit Sportsmans Association, charted her for perch trips. It was a lot of fun, and we caught some nice perch off her. Looking at the pictures of her angled into the water, I not only thought about my memories, but those of the generations of anglers who rode her out to the perch grounds off Euclid/Cleveland and the other cities she called home in her 65 years on the water. How many grandfathers, fathers, sons, brothers, uncles, grandmothers, wives, daughters, experienced the fun of fishing? How many people who can’t afford a charter that may set them back several hundred dollars? How many police departments taking kids out to have some fun and experience something they may have never done? How many groups of veterans, special needs folks, senior citizens? And, how many anglers who have their own boats always looked on the horizon for that green and yellow hull to point them in the right direction of where the fish are biting? The list goes on and on. You see, the Linda Mae is more than just a fishing boat. She’s a Lake Erie icon. She’s been raised and drained and by the time of this writing, she’s on her way to dry dock. Initial inspections show she’s suffered a great deal of damage, and a deeper look is needed to see just how much. There’s a link on Facebook raising funds for her repair, and the owners are going to do all they can to get her back in the water next year, if possible. They wanted to pass along their thanks to all who’ve reached out, and appreciate any help anyone can offer. It's going to be a long road for the Linda Mae. I sincerely hope that they can repair her. She is an important part of the Lake Erie fishing community. I know seeing that green and yellow hull off Euclid Hospital surrounded by a pack of boats with everyone jerking perch makes me smile. The smile that anyone who fishes knows. The smile the Linda Mae played a part in putting on all our faces.